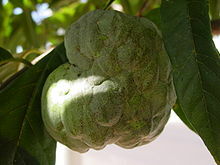 Annonaceae the custard-apple, or annona family, the largest family of the magnolia order. It has 129 genera and 2,220 species. Many species are valuable for their large pulpy fruits, some are useful for their timber, and others are prized as ornamentals. The family consists of trees, shrubs, and woody climbers found mainly in the tropics, with a few species in temperate regions. This page was last changed on 23 March 2018, at 06:33.